The “HumanCharger” manufacturer Valkee Ltd. sent forth lawyers and tried to misuse police force in a failed attempt to silence this website, which is criticizing the company’s practices. The prosecution was stopped now by the officials, declaring there has been no wrongdoing. The full document set is not yet available to the public, because it may still be sealed by the authorities. 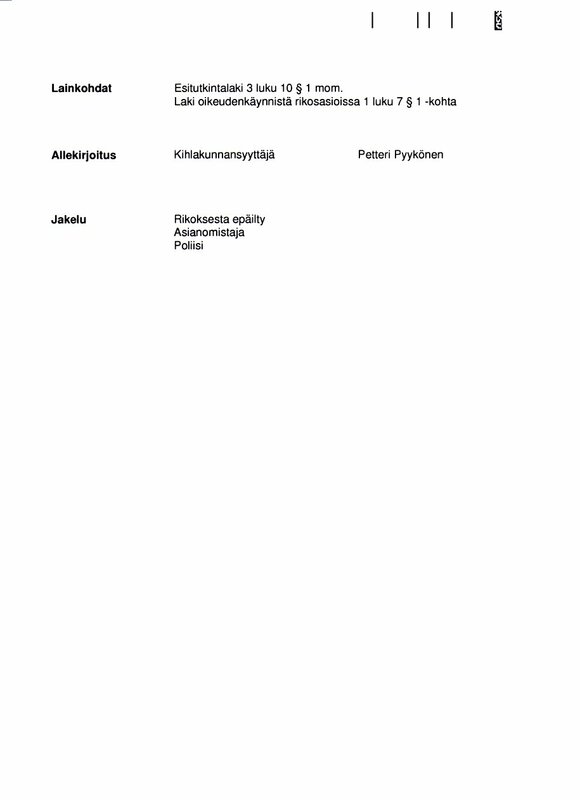 However, according to Finland’s laws on Freedom of Information, after any investigation the material shall be in the public domain. Earlightswindle.com tries to get the scans as soon as they become available. By now it can only describe and cite without revealing the acting persons’ names. It shouldn’t be so hard to guess. See update section below. Valkee Ltd demanded to close this website within weeks of its establishment in late 2012. Until then, the critical view on the once-applauded, self-declared startup firm had less than 50 visitors. The first deadlines set by Valkee’s board expired without effect. Strangely, all communication was sent to a certain person which Valkee claims to be behind this project. There’s never been any message to the e-mail address given for this purpose from the very first day. They did not demand factual corrections. Instead, the earlight firm made clear that this website had to disappear before it could be noticed by the general public. 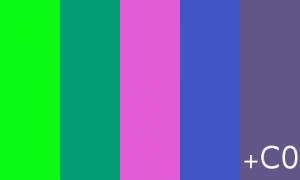 The successive additions to earlightswindle.com during 2013 coincided with Valkee’s problems after reports by a now-critical mainstream press, and the widely recognized 2012 FlimFlam award. Social media picked up the Valkee story in August 2013, overshadowing the launch of the Valkee 2 device. The company had a defensive reply attached to its most important campaign in years. A catastrophic event in marketing terms, followed by the even more devastating independent trial countering their 2013 Christmas campaign. Something had to be done. 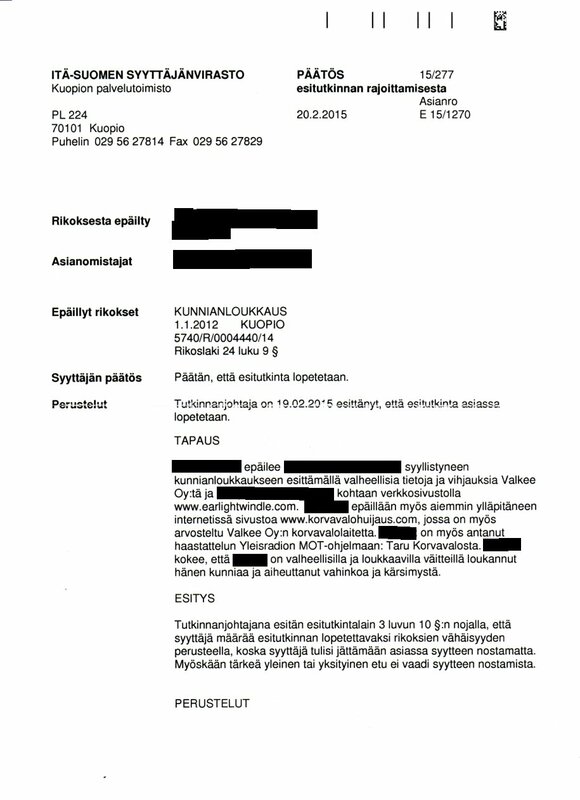 A Valkee representant made a complaint to the finnish police in January 2014. Earlightswindle.com was said to cause massive damage to the company. The person they made responsible should be punished, and convicted to pay compensation. In May 2014, a renewed complaint came in. Valkee saw this site as a vital threat to its operations and shareholders. It urged the officers to act immediately, because now a twitter account EarLightSwindle existed, making the information available to an even bigger audience. Warning: Clicking this is hurting Valkee (says Valkee). 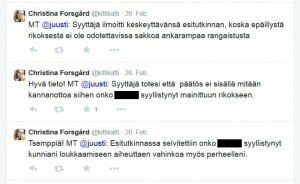 Finnish libel law only covers insults against persons. It rules out punishment for criticism made about one’s business, or science. But there is a foxhole: If the criticism is too sharp, and may directly harm a specific person, it leads to prosecution. Such cases went through the High Court with considerable sentences. The criticism on this site is extreme, and the things told here are likely to hurt persons involved. Yet, it had to be false and mendacious. The truth cannot be unlawful. First, [X] declared to be Valkee in person (“Valkee henkilöityneenä”). Everything said about the company would mean him, because he was speaking for it on countless occasions, and is presumed to be its face. 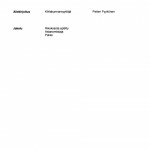 Second, criticism of his work would ruin his career as a researcher. Third, authorities had never investigated Valkee for fraud or anything else, and therefore it cannot be called a scam. 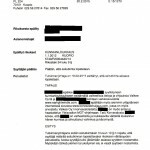 Would that have gone through, it would have enormous impact on free speech in Finland: It would be a punishable offence to use the word swindle, scam, hoax (“huijaus”) without a court decision. Unthinkable? Not for Valkee, the innovative young firm from Oulu Helsinki. products that claim to prevent, treat, or cure diseases or other health conditions, but are not proven safe and effective for those uses. It has no accepted evidence for any of those claims. It has only an approval for SAD. So Valkee’s “HumanCharger” per definitionem a scam, or health fraud, or however one may call this. Practically, and in legal terms. The FDA exculpates that fully, without any need to explain, or to understand scientific details. After one year, the officers working on the case and the prosecutor made the decision to end the investigation, because it is highly unlikely to lead to a conviction under these circumstances. There has been no wrongdoing. Valkee has left only the possibility to call on a civil court. The chances to win the facts are near zero, after it was made clear that nothing unlawful happened. But the company has money left. It would not surprise if they make a last stand. The important message is, that here is no slander, no lies, no defamation. Don’t expect Valkee to accept that. 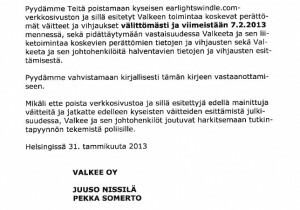 Be sure, Valkee will not be prosecuted for … at least not for their false claims about earlightswindle.com. This thing has caused me sleepless nights, as you may understand. Not so much because of the criminal case in itself – the website was considered court-proof from the beginning simple because of its factual correctness. It shocked me, after all I’ve seen from Valkee, that they are willing to misuse authorities and to mislead them with such bogus claims. This is Valkee, a company of two truths. One the company’s own, the other the outside world’s. Comparing them is like reading Russia Today and the New York Times at the same time and trying to assess whether Vladimir Putin is a good guy or a crook. And if a Valkee-truth is collided with another truth, the company is instantly at your throat. 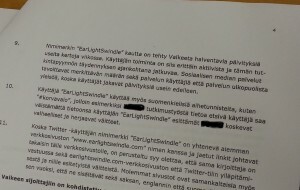 The original, 50+ pages lawsuit material contains absolutely incredible misconceptions, false translations and awesome claims by Valkee. This post may be updated with that if readers wish so. I never told about these Valkee activities before, though I know that “the Internet” hates such commercial censorship. I was just so fed up with the evil. 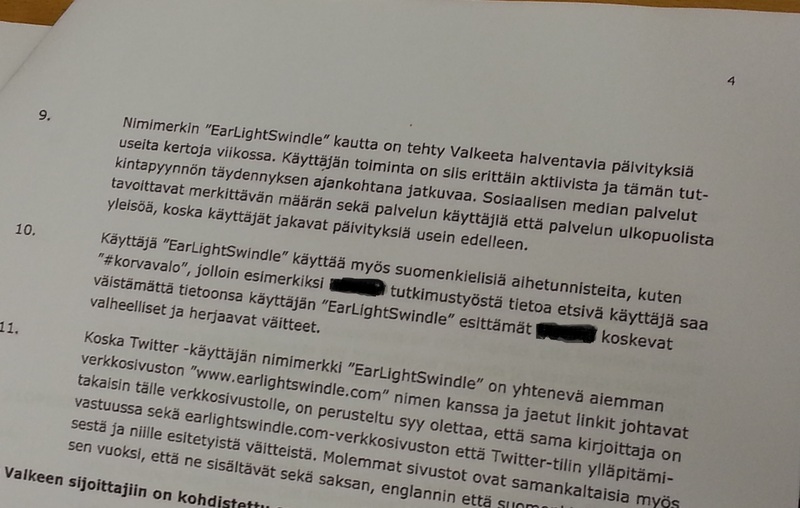 On the other hand, the finnish scam company knew what they were taking on. They knew it would become public one way or the other. Now I need some time out. Mr [X], who filed the complaint for Valkee Ltd, did not want the documents online – for personal reasons, he said. Fine with me, although disappointing for some readers: Saves time and money. His decision demands no comment. I have the complaint scans here, and if someone wants them, you’re free to check it, if you don’t put them online. I gave my word. 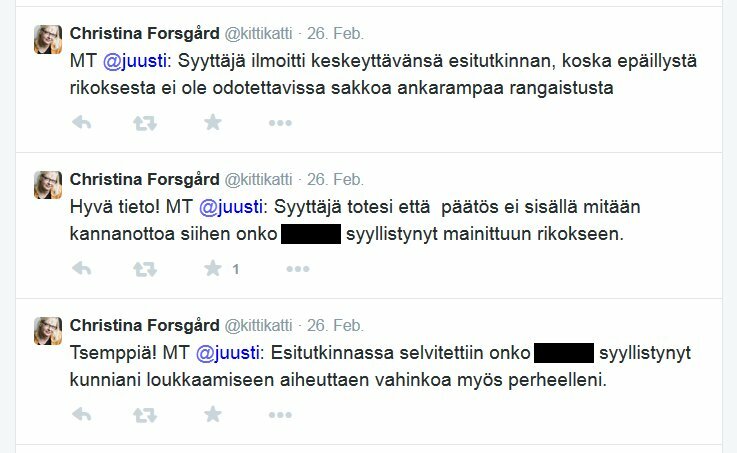 Then I discovered, that Valkee’s PR-mistress kittikatti alias Christina Forsgard was retweeting foul and despicable claims about me to over 6.600 persons. These may not be aware of the role she played in the scandal. – The prosecutor would’ve had stopped the investigation because only a fine (= and no jail term) was to be expected. As if our “too liberal justice system” prevented a conviction. Absolutely awful. Just think a moment: If that would be a reason for stopping, how could anybody be fined at all in Finland? Forsgard must have known that this is rubbish. – The prosecutor’s decision would not tell, if there had been a crime or not. – The prosecutor would have looked, if I did harm to [X]’s family. This is an extremely abject claim, and there was not a single word about this even in the complaints. Of course the prosecutor didn’t check this. Unbearable. So here is the prosecutor’s decision in full. See for yourselves. (…) the investigation shall be stopped on grounds of the crimes’ negligibility, because the prosecutor would not be able to bring a charge. Also, there is no important public or private interest in bringing a charge. It tells, that the prosecutor is allowed to drop charges, if no more than a fine is expected. Only then. This is the condition for stopping, not the reason. 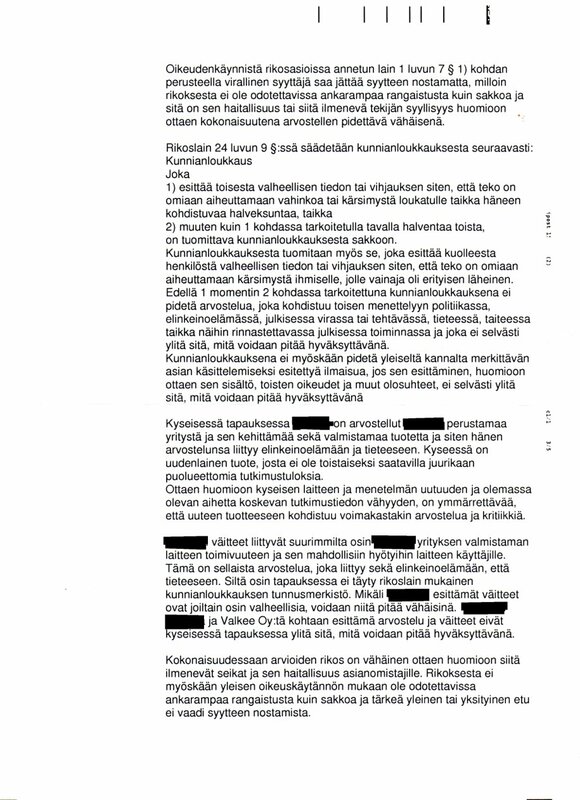 The next paragraph cites the defamation chapter of finnish penal law, and that criticism of one’s business, science, politics, etc. is not libel, if it can be seen as acceptable. As I told in the post above. Taking into account the newness of the device and the method, and the lack of evidence, it is understandable that it is met also with fierce criticism. Then the points of the 2 leading GROUNDS paragraphs are affirmed. 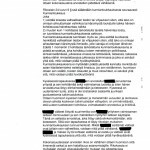 For those who are familiar with finnish lawsuits, the prosecutor is going very, very far, as he can, in making clear that there is nothing punishable. The statement even rules out that charges could be brought for other claims. 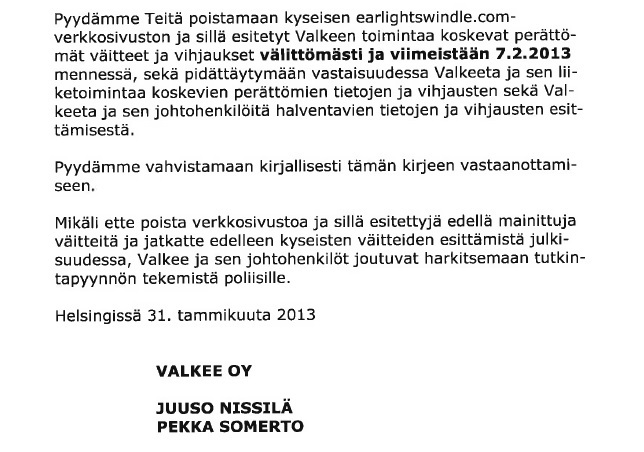 The text even tells, that it is OK to criticise Valkee Ltd, because there is no accepted evidence. Thanks for that nice feature, Mr Pyykönen! It is absolutely disgusting to see, how Valkee’s PR people work. Making statements for those, who do not check the facts anyway. Or for those, who aren’t aware that Valkee’s words always have to be checked. They are seldom true. FYI: Valkee Ltd told it has nothing to do with that lawsuit. Ok. Readers know by now, that everything written here is provable and correct. Just because lawsuits are expected. QED. I see this as a nice joke, and there is no need to answer that nonsense defense.